Many Arsenal fans won’t be happy with how the transfer market has panned out so far but one thing is certain – the Arsenal hierarchy has been very busy offloading their deadwood that offered little or no contribution to the team’s cause last season. In the course of the 2012/13 campaign, Arsenal had some players that worked their skins off and producing the goods on a weekly basis, even if it wasn’t enough to end the club’s everlasting trophy drought. In goal, Wojciech Szczesny had the lion’s share of game time but Lukasz Fabianski had a rare stint at goal that was highly productive. The defense was manned by Per Mertesacker on a regular basis but while Bacary Sagna and Thomas Vermaelen struggled for fitness and form, the performances of Laurent Koscielny, Carl Jenkinson and of course, the intense battle between Kieran GIbbs and Nacho Monreal were worth commending. The midfield had an interesting outlook with injuries robbing the club off the services of Jack Wilshere and Abou Diaby but while Mikel Arteta was a standout performer all season long, Rosicky’s rennaisance and Aaron Ramsey’s late season flourish were heartwarming to say the least. Santi Cazorla however, was in a realm of his own. In attack, Lukas Podolski and Olivier Giroud had to combine to fill van Persie’s scoring boots (there was still some space in the boots though). While the likes of Gervinho and the Ox failed to impress, Theo Walcott’s goalscoring form was a vast improvement in more ways than one. At the end of the 2012/13 campaign, Arsenal would look back at the season with shame bearing in mind that they were outsed from two winnable cup domestic cup competitions by lower opposition that would’ve been defeated any other day. Even if they could take some solace with the Champions League exit in the hands of the eventual winners, the Premier League campaign turned out to be another topsy-turvy adventure that just saw the Gunners sniff at the final Champions League spot on the last day of the season. After accessing the squad, Arsene Wenger and his negotiating chums got busy and many of these players have new employers. Here’s an overview of Arsenal’s offloaded deadwood this summer. In 13 appearances for Arsenal last season, Vito Mannone managed two clean sheets against Stoke and Liverpool. He deputized when Szczesny suffered an ankle injury and on the Pole’s return to full fitness, Mannone was sent back to the bench and never managed to get his footing till the season ended. He has had his fair share of heroics like the Fulham game a few seasons ago where he put up a 5-star performance but in my honest opinion, he has never convinced me and probaly many fans out there that he actually has what it takes to command a starting berth in an ambitious club like Arsenal. With Simon Mignolet departing Sunderland for greener pastures in Anfield, Paolo di Canio’s punt for his compatriot, Mannone, is a highly welcome move and he would thrive in a club like Sunderland where he won’t be under any pressure to deliver but when I remember di Canio’s antics last season, I believe that Mannone would have to really step up. When Andre Santos joined the club in 2011 along with a plethora of “panic signings” Arsenal made after that humiliating defeat in the hands of Manchester United, he looked a decent buy as he offered what Arsenal had lacked in the days of Gael Clichy – an attacking outlet on the left flank. His goals against Olympiakos, Chelsea and West Brom came in vital moments and he enjoyed a good first season by his standards. Last season, things had gone awry for the Brazilian and his performances on the pitch have been nothing short of appalling. His poor positional awareness and dismal defending has cost his team times without number with his performances in the games against Schalke (home), Manchester United (away), Liverpool (home) and Brighton (away) bringing him to the bad books of Arsenal fans. 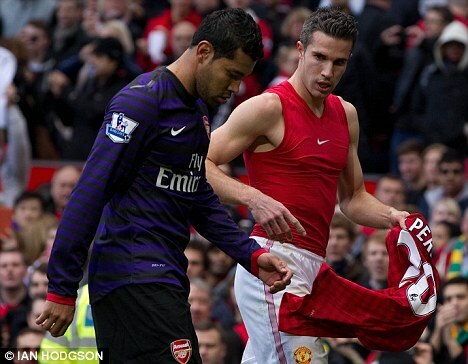 Then of course, there was the halftime shirt swap with Robin van Persie that prompted the fans for ask for his head on a shiny plate. After another bad showing against Liverpool, the manager went to the transfer window when Gibbs suffered an injury, clearly indicating that he had no further plans in his team. He was shipped to Gremio but the club didn’t have the financial capabilities to seal a permanent deal and after grumbling on his return to London, he reached an agreement with Arsenal to terminate his contract. Andre Santos is currently basking in the Brazilian Sun and I must say, he won’t be missed. Deadwood Offloading Conclusion: With Kieran Gibbs injured on the tail end of the January transfer window, Arsenal didn’t think twice before swooping for Nacho Monreal. That speaks a lot in volumes. For those that don’t know, Sebastien Squillaci is the real Man of Steel. The French bloke arrived at the shores of London with an amazing trophy haul from his days in France and Spain and the “experienced” tag on his head that was supposed to be a very in teaching the younger ones like Djourou and Koscielny but he turned out to be the right-footed version of Mikael Silvestre. He even lived up to the Legendary No. 18 own goal billing by heading the ball into his own net when Arsenal played Wigan in the last game of 2010. Pascal Cygan (No. 18) did it in his time and Silvestre (No. 18) was the quickest of them all with an own goal on his debut. Seeing that guy wear the Red and White sends chills down my spine most times because you can never predict the next calamity he’s about to make. To the delight of Arsenal fans worldwide, the Man of Steel’s contract expired and Arsenal wasted no time is rolling the red carpet in front of the main gate of the Emirates. At least, there’s a Daily Planet in the island of Corsica so Squillaci will be doing two jobs – playing for SC Bastia while wearing the Superman outfit inside his jersey. When there will be trouble in the town, Squillaci will leave the pitch and save the day, because when he’s on the pitch, he’s as good as someone that’s off it because he’s a short one as we call it in Nigeria. Deadwood Offloading Conclusion: Despite his VAST EXPERIENCE!!! !, he’s behind Mertesacker, Koscielny, Vermaelen, Miquel and even Johan Djourou’s spirit that’s in the club while his body plays in Hamburg. If he signed a new deal, there would have been a riot in London Colney. Denilson was the part of the Brazil Under-20 side that won the South American Championships and was labeled as the next best thing in Brazil so he snapped up for £3.4m from Sao Paulo in 2006. With World Cup winner Gilberto Silva, Mathieu Flamini, Alex Song and Lassana Diarra all in the squad, Denilson had to settle for Carling Cup starts but as the years went by, Denilson found himself available for first team action and he took his chance in the 2008/09 season because he was the Gunner with the highest amount of appearances that season (over 50 games or so). Jack Wilshere’s emergence in the 2010/11 season limited the Brazilian to Cup matches and substitute appearances in the League but Denilson was a shadow of the player that was quite impressive a few seasons ago. After Arsenal played Fulham at the end of that campaign, the Brazilian told the World that he’s a frustrated figure at the club and he’s going to leave. Arsenal negotiated a loan move for the bloke to his native Brazil and after a spell with Sao Paulo, they failed to match the Gunner’s evaluation for the player and another loan move came into fruition. With the Brazilian outfit failing to meet Arsenal’s demands again, the player took things to his hands and like Andre Santos, his contract was terminated. Now he’s back with Sao Paulo after joining as a free agent, wily old sly foxes, the lot of them. Deadwood Offloading Conclusion: Instead of trying to fight for his place with Jack Wilshere and Aaron Ramsey, this Brazilian brought out a white flag and chickened out. Good riddance. After an extremely disappointing campaign, Arshavin’s time with Arsenal is up as the club chose not to renew his contract. He was reduced to spending a lot of time in the dugout and when he came on, he looked rather uninterested. He was pretty impressive in the Capital One Cup last season and his only significant Premier League moments include his late cross into the box that led to the goal against Queens Park Rangers and the penalty he won for his team against Fulham. In what became his final appearance for the club, Arsene Wenger summoned him with 15 minutes left to play when the Gunners visited Stamford Bridge. With the Gunners trailing, they needed inspiration from anywhere but when the ball came to Arshavin’s path, he was found wanting. Some say that he was played out of position, others said that his attitude was lackadaisical. I say that he’s a technically proficient player that began his career in the club like a house on fire but plummeted into mediocrity due to his lethargy and lack of work ethic. Johan Djourou and Francis Coquelin may be technically regarded as “deadwood” as well, but they are currently on loan and still have contracts with Arsenal so I decided not to add them on this list. As for Marouane Chamakh, Park Ju-Young and the World’s Best Striker, Nicklas Bendtner, their cases are in Mount Olympus. You can download the Gooner Daily BlackBerry App to receive notifications on your Smart Phone when a post is published. Feel free to visit Gooner Daily’s Facebook page and click on the like button. Posted on July 31, 2013, in Arsenal, Football, Premier League, Transfer Gossip and tagged Andre Santos, Andrey Arshavin, Arsenal, Denilson, Football, Premier League, Sebastien S, Transfer Gossip, Vito Mannone. Bookmark the permalink. 4 Comments. Join the Gooner Daily Mailing List and receive notifications anytime a new post is published!